The conditions were looking fantastic to be up in the Perth Hills and Monday blues would have to wait another day as I was going to Kalamunda Mountain Bike Collective to cycle a 24.3km cross country loop of the collective by combining a number of blue graded single trails through the forest starting and ending at the Camel farm. The mountain bike ride begins from the Camel Farm and right into the forest as I warm up along Joeys Line, a climb over a number low lying rock sections. 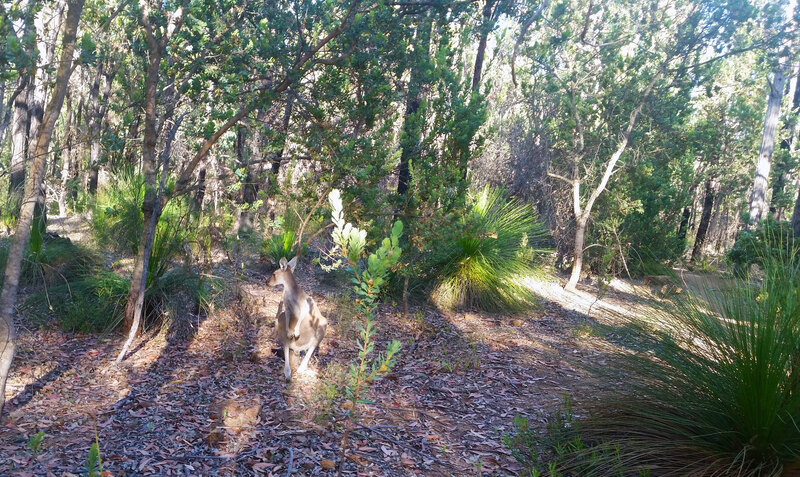 Rustling sounds to the side of the trail slows my pedal and I spy a small Kangaroo staring back and me and then turning around for a quick retreat. Dugite meanders swiftly around trees, the tight trail briefly exits the forest crossing Asher Road and feeds into one of my favourites trails in the collective, Camikazi. Camikazi is great fun as it descends towards the valley, peppered with exposed roots and rocks and plenty of tight berms and obstacles to keep the ride interesting. There are a few drop offs and some can also be rolled down or launched from, alternatively there is a B option to deter the obstacle altogether. 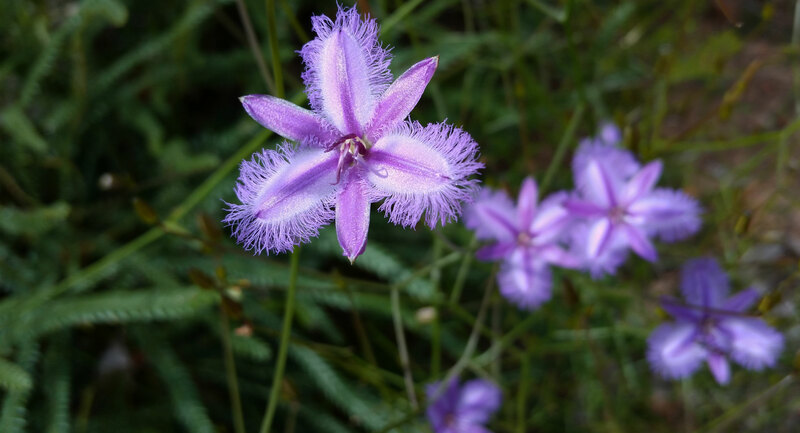 This side of Mundaring Weir Road is particularly beautiful under the canopy of the Jarrah Forest, especially the lower cover of native zamia plants. At the end of spring and following a wet soaked winter I am riding in much cooler conditions and on tightly compacted ground. As summer approaches the trail will eventually change, it will dry up and the pea gravel loosen to rock marbles which will either be slippery on a descent or a slowing sand pit like experience on uphill sections. While most in the northern hemisphere bike on snow, at the same time when summer arrives down here in Western Australia we bike on dusty pea gravel. I never want Camikazi to end, especially that last section, but it does and ejects me onto a track. 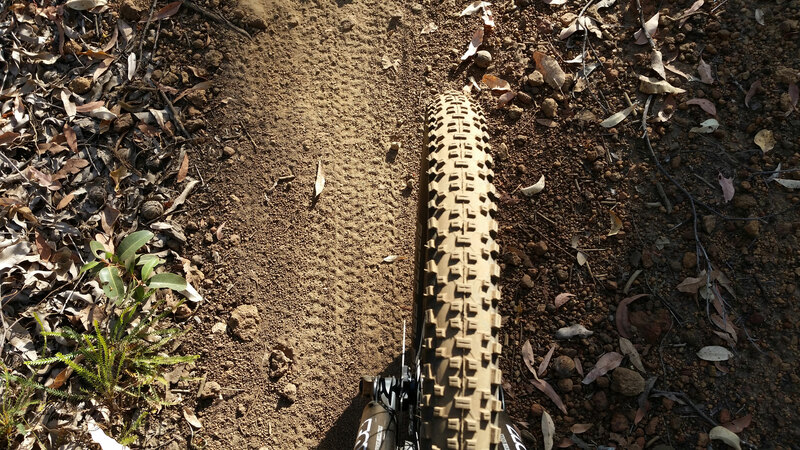 I then head left down into the valley, following the tyre markings of other mountain bikers through the rutty slope which dips down and up onto the Munda Biddi/Kalamunda Circuit. One of the advantages about riding close to spring time is coming across wildflowers, and I am pleased to see some lingering. Tiny in nature and sparsely spread through the landscape, I find a cluster of Fringe Lily wildflowers growing close to a granite crop. The intricate detail of the petals and soft purple colour are something of a bush fairy land imagined by artist May Gibbs. 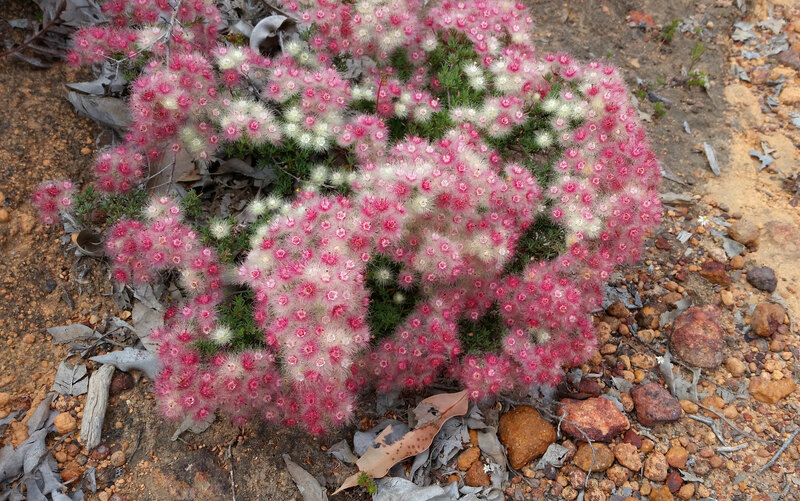 They flower between August to December in Perth and other areas of Western Australia. I exit right onto X files which climbs around corners all the way to FJ and then I am cruising with a few inclines on generously flat terrain. 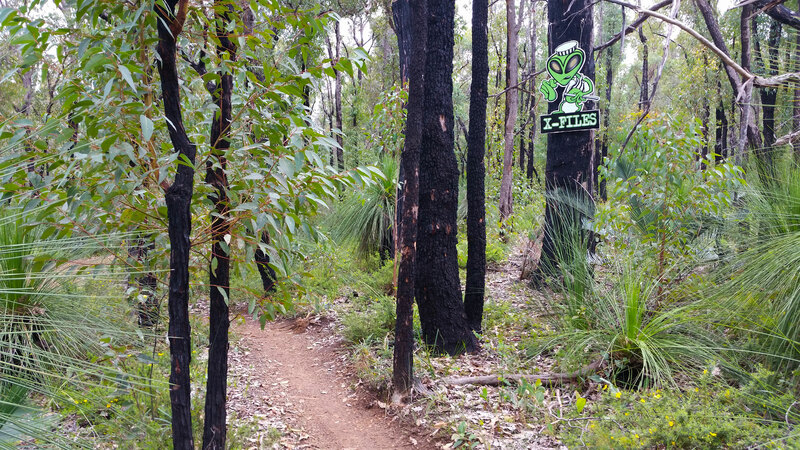 On the Kalamunda collective map, X files and FJ are longer cross country trails that detour away from most trails and further into some scenic sections of the forest. I find fuzzy Verticordia flowers bursting from the ground. I take a fire track towards Dell carpark, turning left I follow Metasoma trail all the way to the next climb. Lube me up is all uphill to reach the entry of two enjoyable descent trails and I feel a slight burn in the legs as I climb and navigate switchbacks up and over several rocks and tree roots. A small clearing welcomes me as I officially reach the very top and a log is where I take a few minutes of rest, digging into my backpack pocket in search of a dairy milk chocolate. Later on, after the dairy milk chocolate I find a sun orchid basking in sunbeams. 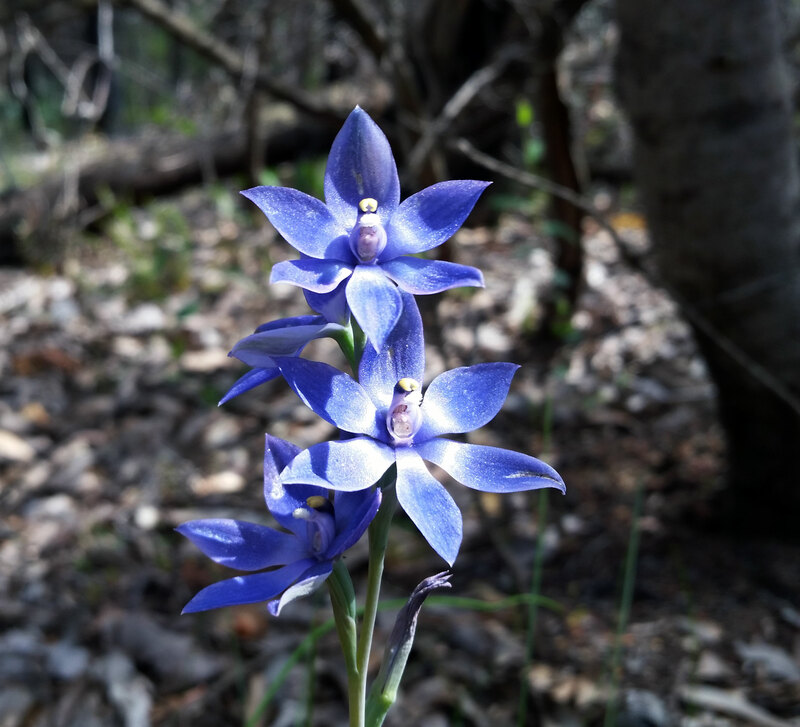 Unlike everything else, wildflowers seem to never blend into the surroundings, they always tend to be a stark contrast to the bush coloured landscape. The two trail choices are Scorpion or Feral Groove but as I am planning to also ride to Mt Gunjin I decide on the obstacle fun trail, Scorpion. The descent is as fast as you make it and the features like the wooden berms, rock gardens and a big log rollover come up very quickly on the tightly woven trail. Grass trees thrive in the area and the randomly placed solid rock gardens are super fun along the tree bordered trail. The fun trail finishes up with a few rollable jumps at the very end. Following Scorpion, I take a fire track back to the dell carpark where I cross Mundaring Weir Road to the Mt Gunjin side. The local authority have carried out a prescribed burn recently in preparation for summer, the burn appears to have been a hot one and the smell of fire lingers in the air. 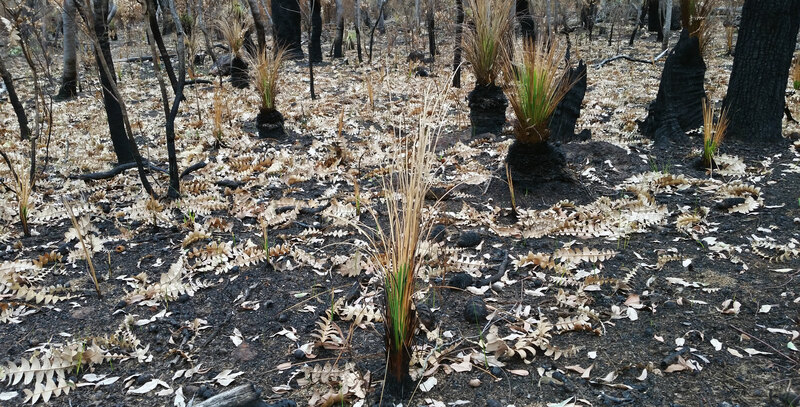 These prescribed burns are to protect people and assets from bush fires during summer, they are carried out in sections. I don’t know too much about the research into this method but I also don’t see any wildlife in this section today. Hopefully they return when the area recovers. Mt Gunjin is the highest point in the collective with several descent trails in various directions. To reach the top I opt for the more forgiving Drago trail which firstly descents in a swift manner before it snakes the side of the hill to an open view at the power line track. It’s nice to take in a view outside of the forest. From this point it’s one way up, along Mother in Law, my all time favourite hill climb in the collective. Mt Gunjin is also accessible by a rough car track and there are periodic shuttle days for riders wanting to experience multiple descents without the hard climb. From Mt Gunjin I’m heading back to the camel farm and combine a number of descent trails (Goldilocks, Muffin Tops, a bit of the Mundi Biddi Touring Route, Horny Devil and Camel Train). Muffin Tops is naturally quite fast even with applying the breaks and I can feel my wheels leaving the ground when I go over the table tops. While I’m covering more and more distance on the bike, committing to getting air is something that isn’t coming easy as much as I want to commit. Horny Devil is pleasant and for those wanting to progress from green descent to blue descents close to the Camel Farm, Horny Devil is worth a shot. I startle an emu somewhere amongst the trees, it runs around in circles before dashing off. The Black Cockatoos hang out in this area and I can hear their mighty shrills above me. Returning dusty and sweaty, it felt good to be out on the dirt trails immersed in nature and even a few pretty wildflowers. 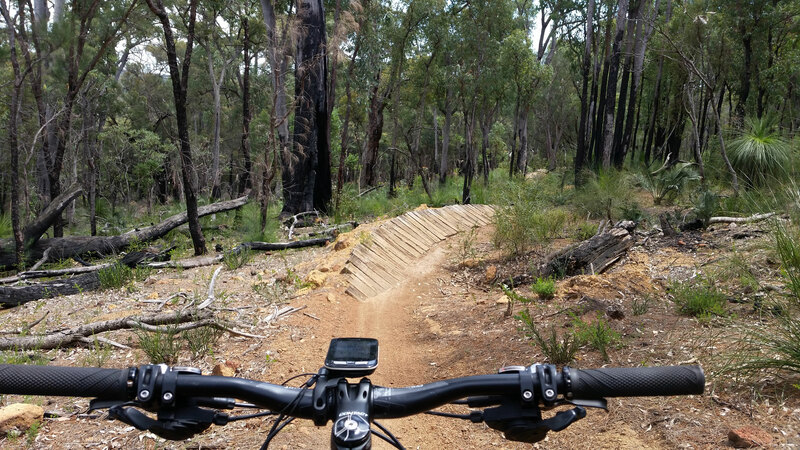 Kalamunda Mountain Bike Collective is one of the closest mountain biking areas to Perth. 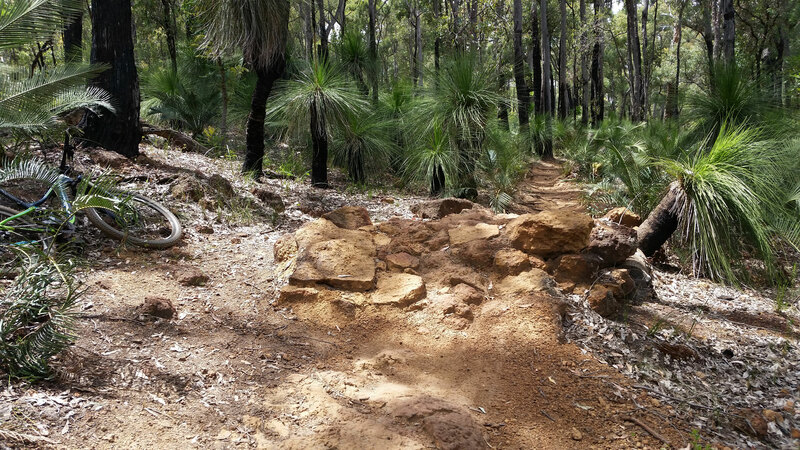 The single mtb trails are maintained by volunteers and donations to the collective can be made through their website here. 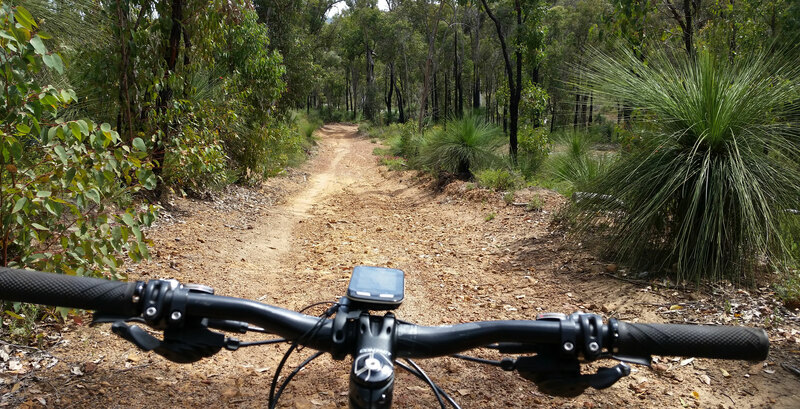 The surrounding area offers so much potential in terms of nature activities and not isolated to mountain biking, there are hiking trails including the Bibbulmun track. 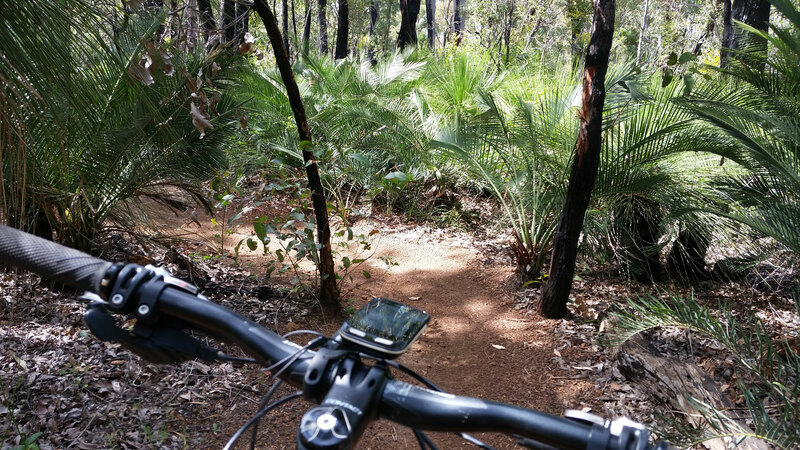 Trails to Mundaring town through Zamia State Forest and Beelu National Park and also into Kalamunda town centre from the other side. 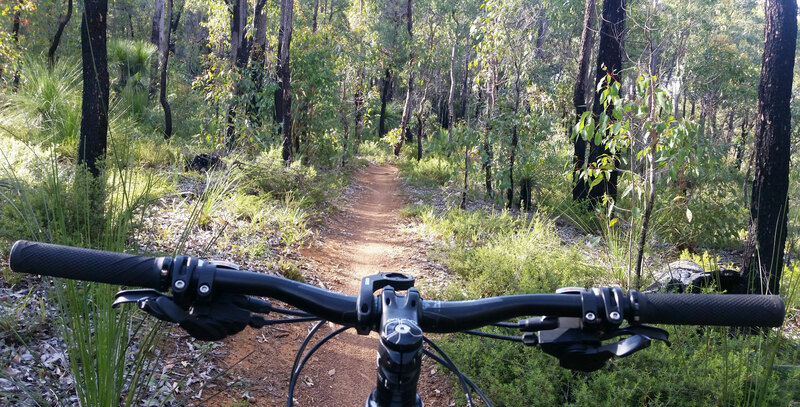 Depending on how far you can walk or cycle, the Railway Heritage Trail also connects to some very pretty areas including John Forrest National Park and Leschenaultia Conservation Park.